It is important that your players know how to set correct screens. The first drill is a pass and "screen away" drill that helps stress all the ingredients of setting good screens, and teaches the pick and roll move. The second drill is a screen set for the ball-handler, with execution of the pick and roll move. 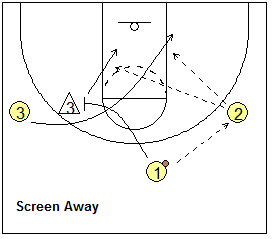 For the important basics of setting screens, see "Setting Screens". Drill #1. Pass and Screen-Away. Create three lines out along the 3-point arc corresponding to a point guard, and both wing positions (see diagram). Have an assistant or manager be the token defender on the left wing. The point guard starts by passing to the right wing. He/she then "screens away" for the left wing, setting the pick on the defender. The wing player cuts around the screen and gets the pass from the right wing, and takes it to the hoop. The screener should "roll" off the pick after cutter comes around. 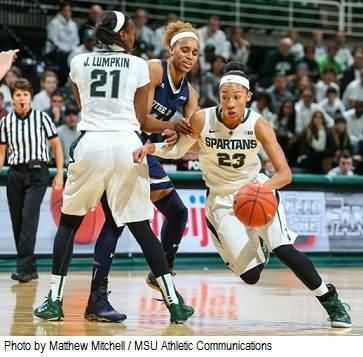 See "Setting Screens" for correct screening techniques, and the pick and roll technique. Have the players rotate right wing, to point, to left wing. Also use the simple screening drills on that page to teach how to read the defense and how to use all of the options that can occur when setting and using screens. Make sure that the screeners make contact, get wide and strong and stationary with arms in, and make sure they have the correct angle on the screen. Make sure the player cutting around the screen waits for the screen to develop, and "rubs off" the screen correctly. Make sure the pivot on the roll move is toward the cutter, not away... a player should not turn his back to his teammate. Make sure as always that players hustle, and the passes are sharp. Once you feel that your team is making good screens, "go live". Break up into groups of three, and put a defender on each offensive player. Tell the defenders to allow the first pass to the right wing, but then play tough "D". You can now also teach your defense how to fight through, and slide behind a screen, and how to call a "switch" on defense. You can also start with a pass to the left wing, and screen right, or let the point guard go either way. Look at the diagrams below for common screening errors. Drill #2. On-Ball Front Screen with Pick and Roll. O1 and O2 have defenders on them. O2 sets a front screen for O1 (Diagram A). O1 dribbles around the screen, "brushing off" the screener. If the defense does not switch, O1 takes it in for the lay-up (Diagram B), and O2 will roll as the trailer for the rebound. Now see Diagram C for the next option. If the defenders switch the screen, O2 (after screening and pinning the defender) should "roll" to the hoop, and expect the bounce pass from O1.